Carters Creative Catering is AH-MAZING. We loved all of the food that we trialed and LOVED the fun option of having a heavy appetizer only menu at our reception. Holly and her team worked with us to create the perfect menu options for us. We loved her so much that when my company needed a caterer for their work parties, I unflinchingly recommended Carters. So I have tried their food at 4 events now (two company parties, our rehearsal dinner, and our reception) and have yet to find anyone come close to matching their price and quality. Our guests (both at work and wedding) loved their food and couldn't stop raving about how delicious it was. I cannot recommend them enough and I'd encourage anyone to book now before they raise their rates because I think they're under priced for the value you get. The food was amazing at the tasting and then at the wedding. Everyone loved the food and the cake. 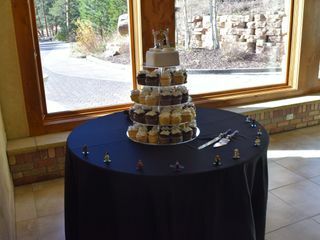 We had a lego themed wedding so we wanted to figure out a way to incorporate that with our cake and what Holly and her team came up with was awesome! Everything was so yummy, a lot of people wanted what was left over so quite a few family members went home with extras lol. Thank you so much! Carter’s was phenomenal! They were incredibly professional and responsive and the food was amazing.my guests were raving about how great the food was. I couldn’t be happier! Carters Creative Catering was incredibly flexible, helpful and delicious! They worked with us to craft the perfect dessert reception. We received a ton of complements on the food and the servers day of were so helpful! We had a brunch wedding reception for 50 guests, all of whom had rave reviews of the food. The pepper-maple bacon was amazing. The service and staff was timely, kind, helpful, and overall fantastic. We will use Carter's for any and all major events. Carters was amazing! Everything was so good and we had so many compliments! I'm so glad we went wit Carters for our wedding! I did a destination wedding in Colorado last month. Carters went beyond my expectations with my wedding. Holly welcomed us into her home for a tasting and she won us over with the comfort food. They were fast to respond any tie I needed help with anything. Holly was also able to order my china, chairs, and items needed and arranged for the items to be picked up and delivered to the reception. That was outstanding for me and took off so much stress for me truly. Holly also told me that anything I needed help setting up to leave in a box with directions for them to help with. When we arrived the day of the reception, I was so impressed. They treated Dylan and I so special and were so welcoming. Everything was set up perfect and exactly the way that I wanted it. They had food ready to go and ready to serve. The staff walked around constantly asking how the food was or if they could take anything off the table. The food not to mention was amazing The price we paid included so much Food It was amazing. We got so many compliments on the food from our guests. One really cool thing Carters did was they stayed and helped clean and pack up everything we brought to the wedding. They really helped clean up which I was so Thankful for. I am so impressed with the services that were provided. One very last detail was since I got married out of state Holly offered to bring back my cake stand to the cake lady for me and that just blew me away. It was so thoughtful and I was so happy. We had a brunch reception and everyone was excited because we kept talking up their amazing green chili we had during our tasting. Carter's did not disappoint! Everything was wonderful! We got so many compliments on the food and the staff, too! Plus they boxed up the leftovers for us to take home- sooo good on the morning after our wedding! :) Eric and Holly are such a great team and they were so nice to work with throughout the entire process. Both came over to congratulate us and asked if we needed anything during the reception which I thought was really sweet! We are so glad we went with Carter's Creative Catering! Eric & Holly were one of the preferred vendors (on a long list) for our venue. We are so glad that we chose them! They were reasonably priced and we LOVED their food! It was far better than some of the higher priced caterers that we had done tastings with. Our guests raved about their food and their staff took such good care of us. They were so good to work with and we would recommend them to anyone! Holly was always quick to respond and lovely to work with! They accommated my every need. The food was delicious and beyond expectations. My family loved everything from the appetizers to the buffet. They were also my caterer for the cake, which was beautiful and tasted just as great! I couldn't have been more pleased! Carter's did our catering and made our cupcakes (and a small cutting cake). We got so many compliments on everything, especially the mac and cheese bar and the Boston creme pie cupcakes. We would definitely use them again! I would like to say that this was the best choice we made for our Son's wedding next to the location. Carters Creative Catering made it so easy for us and took all the stress away before and during the wedding. The food was delicious and we got to take home the leftovers. I wish we would have had sliders left over, but they were so good, not one was left to take home. They were big too, not little tiny sliders! The tasting they did before the wedding was even amazing. I thought we would taste two or so items and they made everything I had picked. Plus the Bride could not make it, so they sent us home with her plate. It was a wonderful experience and we would use them again! The food was so good and the waitstaff went above and beyond what they needed to do. Carters Creative Catering catered our wedding on 06/08/2014 at the Della Terra Mountain Chateau in Estes Park, CO. Our DJ recommended these guys to us and man we were very happy. Holly was so helpful helping me choose the food items so that we stayed in budget. When we went for our tasting we were able to bring my parents and we had the best time at their home. And this was no ordinary tasting there were no bit sized finger foods. oh no Eric made us the whole meal and Holly made full cupcakes for us to try. When we left we all felt like we just got done with Thanksgiving dinner. The day of our wedding Holly and her staff came on time, prepared and dressed for the occasion. I didn't have to do a darn thing! Us and our guests were so happy with how they did everything. The food came our great once again. and OMG our cake and cupcakes were the hit of the party. Holly did such an amazing job on our Skull cake and skull cupcakes. I can't wait to see what she does for us for our one year anniversary. For you bride to be out there give Holly a call, you will be very happy. Carters Creative Catering did such a great job at our wedding. Their staff was professional and did an amazing job at serving our guests at both cocktail hour and during the reception. They were able to create our unique menu with no questions and were so easy to work with. Holly also made our cake and it was beautiful and delicious! Our guests still comment on how great the cake tasted! We really wanted to have a custom menu of Italian and Korean food. Most places quoted us an insanely high cost and then tried to get us to do one of their premade menus. Carter's had no problem with our menu choices and were very affordable! They also were able to have spaghetti for us. Something we were told was impossible by other companies. Everything tasted great and was perfect. Our guests kept telling us how wonderful the food was! Carter's also did our cake. We had four different flavors and it was so good that we had none left over! Holly did a great job with both the taste and presentation. It was perfect. Would definitely recommend Carter's! Okay so Holly and Eric were AWESOME! They took care of everything and are so flexible! They were so nice with everything. It all looked smelled and tasted great! they even package leftovers and let you take it home! (most caterers said they wouldn't do it or you would have to pay extra!) They definately helped make my night Great! Eric and Holly were great. They were very flexible on meeting times and were always very friendly. They were more than happy to work with our budget and were willing to make absolutely anything we wanted them to make. They were very professional and the food was excellent. We have already had a few engaged couples that were at our wedding ask for their contact information because they loved the food. I would highly recommend them to any bride looking for friendly caterers with awesome food! Chelsea we had fun working with you! Thank you for passing our information to your friends. Referrals are exactly what we like. Your friends will receive a 10% on food costs when they let us know that you referred them. We appreciate your great review!! Eric and has wife were wonderful! Very helpful with choosing the menu and flexible as well. He is a FABULOUS cook! The food was perfect. Service was perfect! And excellent pricing to top it off. If I ever have another event I will be calling Carters!! Carter's Creative Catering was fantastic!!! From the first time we met Jeff and Eric we knew we were in good hands. They are both very passionate about what they do which made all the difference. They were by far the best priced and we got more than we had expected for our money. They are so flexible and willing to adapt the meal to your specifications. The food was so delicious and it was presented so beautifully! They made the whole process so easy and I would use them again for another occassion. This is the second time we have used Carters. The first being our wedding in 2012, and we loved them. Holly and Eric's attention to detail, professionalism, friendliness, and cooking ability is top tier! We just used them for my 40th birthday party and the food was amazing! If anyone is looking for a catering company for your wedding, party or work event give Carters Creative Catering your first look. To say that Carter's Creative Catering hit it "out of the park" with their catering for our garden party, would be an understatement. Eric and Sammie arrived on time, actually a bit early. Their presentation/set up looked superb. So appealing. We chose the cooked to order (for each guest) pasta/protein/veggie/sauce bar. I had been fantasizing about this meal ever since I last had it, about a year ago. Not only did it live up to my remembrance, but it was even better than I had hoped for, and expected. Every single guest (35) felt exactly the same way. I would do it again in a heartbeat, and can't wait for an opportunity to use this amazing company again. We used Carter's Creative Catering for our cake and cupcakes. Holly was so friendly and wonderful to work with. We are from out of town so Holly worked well with setting up meetings and tastings convenient for us. We explained our budget and our wishes for the cake and cupcakes and Holly exceeded our expectations. The price was amazing and the final product was exactly what I explained I wanted. Holly set up the cake and cupcakes at the venue and it was absolutely beautiful. Our guests enjoyed the variety of flavors we had to offer and said everything tasted amazing! My husband and I agreed! We highly recommend this vendor!